Ismail: When it came to violence, "I could tell it was something they wanted to do"
WASHINGTON (CNN) -- Humza Ismail hasn't spent much time in Raleigh, North Carolina, since he started graduate school two years ago. But when he heard two former acquaintances were arrested on terrorism charges this week, he says, "Honestly, I wasn't surprised." Omar Aly Hassan, left, and Ziyad Yaghi were clear on where they stood on terrorism, an acquaintance said. Omar Aly Hassan, Ziyad Yaghi and five others are charged with conspiring to commit violent jihad overseas. An eighth suspect is still being sought, authorities have said. When he lived in Raleigh, Ismail worshipped at the same mosque as Hassan and Yaghi. When groups of young men talked there, Ismail says, the conversation often turned to religion and politics, and Hassan and Yaghi made it clear where they stood. "When it came to something like suicide bombing, they would say, 'If it's a benefit for the Muslims then something like that can be permissible,' " Ismail says. "I could tell it was something they wanted to do." But, he adds, "They never indicated or said 'we are going to make jihad overseas.'" Ismail says the duo spoke in glowing terms about Osama bin Laden, calling him a scholar and a mujahedeen. "You could tell they were being influenced by somebody," Ismail says. He does not know by whom. He feels they were susceptible to a message of violence "because it sounded cool and exciting." Ismail says he strenuously disagreed with Yaghi and Hassan's views on terrorism even, he says, getting into a public shouting match with them at a restaurant. He says he told them, "You can't do this, man. You can't say it is OK.
"That is corruption and terrorism and that is not permissible in Islam." Ismail says he and others raised concerns about Hassan and Yaghi to officials at the Islamic Center of Raleigh, but were "overlooked." "I did my part," Ismail says. 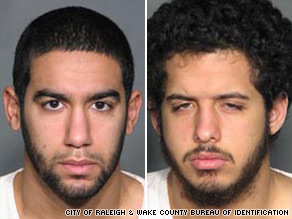 Imran Aukhil, a spokesman for the Islamic Center of Raleigh, told CNN on Thursday that he had no information about complaints concerning Hassan and Yaghi. On Saturday, however, he informed CNN that he had researched the matter and learned there was a complaint several years ago against an individual at the mosque. Aukhil said he did not have the name of that person. "It was reported to the FBI," said Aukhil. "The FBI did take note of it in their investigation." Efforts to reach attorneys representing Hassan and Yaghi were unsuccessful.